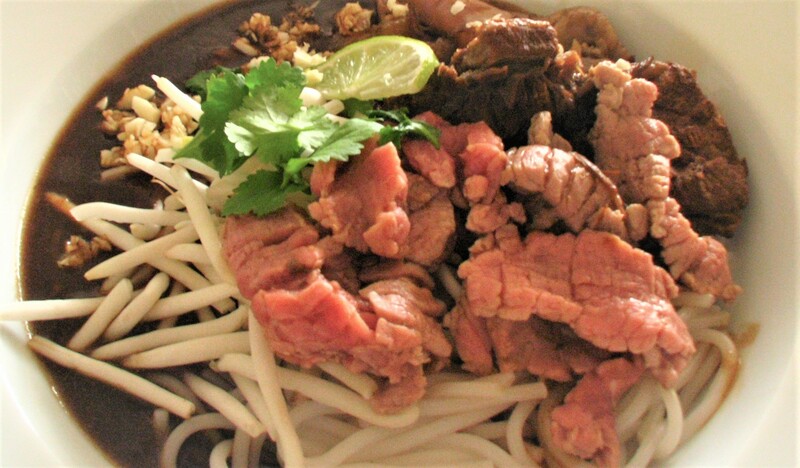 In Singapore, many people call this “Odeon Beef Noodles” because of a famous food stall that used to peddle opposite the Odeon Cinema back in the seventies. The cinema is not there anymore neither is the stall, but the dish has been existing for a long time even prior to this. A famous one that has survived is the Hock Lam beef noodles restaurant. This is my take on this popular beef noodles. No one really knows about the origin of this dish, many claim it to be Singaporean. 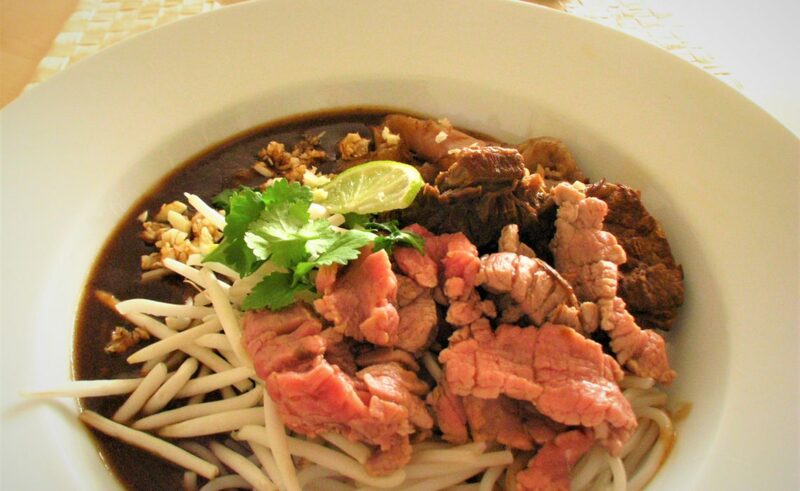 After some browsing on the web, I suspect it is closely linked to the beef noodles in Qiong Cuisine (琼菜) of Hainan Island (海南). Hainan Island is the only tropical island of China and is a province on its own. The only part of China located in Southeast Asia, the cuisine of Hainan incorporates many aspects of Southeast Asian cuisines, those of the native Miao and Li nations and the Chinese cuisines to its north such as Ao cuisine (粤菜) of the Canton province and Min cuisine (闽菜) of the Fujian province. Qiong cuisine uses Southeast Asian spices, calamansi like in Filipino cuisine, tropical fruits such as mango and papaya, as well as coconut milk and flesh like in Thai cuisine. A famous dish is sea crab cooked with coconut. They often employ a fermented sticky-rice wine (山兰糯米酒) made by the Li people, unlike the Shaoxing rice wine used on the continent. For this recipe, you will need a spice sack and three big pots. Boil 4 litres of water in a pot (Pot A), place in it your ribs and tendons, together with your ginger and garlic. Once boiling, add 2 tbs Oxo beef stock, suan cai, 3 tbs dark soy sauce and salt and pepper to taste. Cover and let it simmer for 15 minutes. Turn off the fire and take out half of the soup (around 2 litres) and put it into another pot (Pot B) and leave aside. Put your spices into a spice bag, seal and place in the pot/or use five spice powder with the soup and all the contents (Pot A). Cover and simmer over low fire (around 140 degree celsius) for about 6 hours. Add water if necessary to prevent it from drying up beyond half of its liquid. The idea is to cook the tendons until they are extremely soft (not even springy) and the meat falls off the rib. Once done, take out the spice bag. Transfer all the ribs, meat and tendons to the other pot of soup (Pot B). We can now make the gravy: Add another 2 tbs dark soy sauce, 100ml of fermented rice wine to the Pot A. Bring to boil. There should be about 1 litre of soup left after the six hours of simmering. Add some more Oxo beef stock, salt and/or pepper to taste, if necessary. Mix 5 tbs corn starch in a bowl with water of room temperature, mix well. Slowly pour into Pot A with one hand and with the other hand use a ladle to stir very quickly to prevent clustering. Once the mixture is thick, dark and sticky, turn off the fire. We now make the beef soup: Bring to boil Pot B, add in your sliced beef tripes and beef meatballs. Let it simmer for 5 minutes which should turn the meatballs and tripes soft, turn it to low heat and let it bubble. Bring to boil a large pot of water (Pot C). Once boiling, cook your rice noodles for about 3 minutes. Once ready, drain and serve in three big bowls (around 200g per person). From the contents of your beef soup (Pot B), pick out the beef ribs, tendons, stomach and meatballs and distribute evenly among the three bowls. Place your slices of fresh tenderloin on a ladle and scorch them slightly with the boiling soup of Pot B. Distribute into three and place in the three bowls. Put your fresh beansprouts on top of the noodles and the meat. Pour 2 ladles of dark gravy (from Pot A) over the content of each bowl. Garnish with coriander leaves, minced suan cai, a dash of white pepper, minced garlic and a squeeze of calamansi or lime. Serve with a bowl of soup from Pot B, garnished with coriander leaves, and a saucer of dip sauce made with chili sauce and calamansi juice.